Q: How to add an Auto Play button to the toolbar of the flash book? The page flipbook software has brought much convenience to us. And commonly, most readers would like to read an e-book which can flip automatically. So I want to add an Auto Play button in the toolbar for my readers. How can I make it with the PDF to FlashBook Standard? Well, you could add an Auto Play button to play the flash book automatically whenever you like. And you can also make your book to play automatically as soon as you open the book. Now let’s learn to add an Auto Play button. 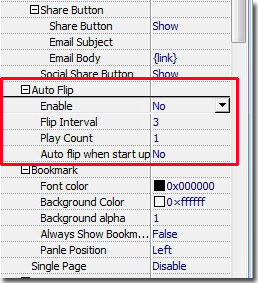 Step1: find the “Auto Flip” group in the right Design Setting panel. 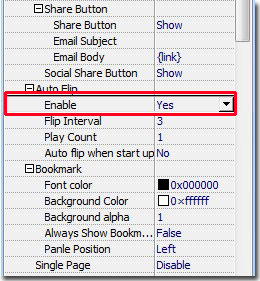 Step2: transfer “No” to “Yes” in the “Enable” bar. Apply change and then you can see an “Auto Play” button has been showed in the toolbar.